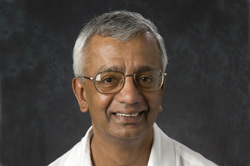 Leading La Trobe University economist, Professor Sisira Jayasuriya, has been appointed by the United Nations Food and Agricultural Organisation (FAO) as a principle researcher in a study on agriculture and food security in Asia. Highlighting the nexus between agriculture, food security and finance, the study will be conducted in 11 Asian countries (Bangladesh, Cambodia, China, India, Indonesia, Malaysia, Nepal, Philippines, Sri Lanka, Thailand and Viet Nam) between October 2009 and January 2010. The study will analyse recent global trends in the context of the global financial crisis and focus on issues such as increasing food prices and poverty. Professor Jayasuriya's research for the UN Food and Agriculture Organisation is not only of great importance, but will hopefully have a very real and practical impact on lives of many of the world's most vulnerable, said Gary Magee, La Trobe's Head of School Economics and Finance. The U.N will publish the research's finding in May 2010.